"I believe that PH2O is a really exciting opportunity that will help us invest in the next generation of athletes." 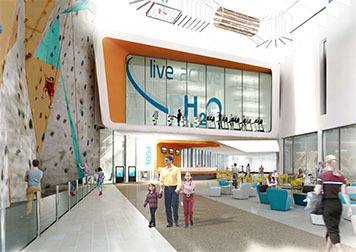 PH2O is our vision for delivering a sustainable hub of sports, leisure play and physical activities services that would include swim, gym, ice and other popular favourites. As well as this we're looking at an enhanced offering in the form of outdoor climbing walls, high wire and adventure play. By creating an iconic public space, a unique experience and a dynamic mix of more than twenty sports and leisure opportunities in the heart of the city of Perth we will deliver not only health, social and recreational benefits but also economic growth, sustainable facilities and tourism potential. "This is a real opportunity, not just to replace ageing facilities and reduce costs, but to deliver a flagship project which Perth can be truly proud of. "